Bob Reid of Reid Heating & Energy. Internet research can be helpful in narrowing down the selection process, but it may be best to consult with, and purchase a boiler directly from, a local dealer or contractor, and one who will be available for follow-up service and warranty facilitation for years to come. Also, always look for installers with a C-4 license, which allows them to legally perform repairs and maintenance involving boilers, hot water heating, and steam fitting, assuring proper installation. The latest technology combines the radiant boiler with the home's traditional domestic hot-water heater. These combo units free up considerable garage space, replacing the bulky existing water heater and boiler with a small, usually tankless, all-in-one model. Another bonus: several models allow the addition of a solar storage tank for a fully integrated solar hot-water storage system. “These combination systems not only save space, they are very high efficient,” LaChance says. Cynthia Ishimoto, an owner of a four-bedroom Eichler in Palo Alto, replaced her old radiant-heat boiler system with a combination boiler/hot water heater unit in 2007. “We noticed that our heating system was starting to fail when certain rooms were hot and some were not,” Ishimoto says. While nursing along her old boiler, she also noticed the water heater starting to leak. It became obvious that replacement was on her horizon. Mike laChance of Lachance Radiant Heating. After reviewing several model recommendations and price quotes, Ishimoto went with LaChance, who, at the time, recommended that she replace both the original boiler and hot-water heater with a single Quietside (by Samsung) tankless combo unit. The tankless feature was fairly new then, but it was the solution she had been looking for—eco-friendly and space conserving. Ishimoto indicated that the new combo unit also made a significant impact on gas usage. In January 2005, her family's usage was 231.2 therms. After the install, for usage in January 2008, she reported that figure dropping to 130.44 therms. In May 2005, her gas usage was 52.5 therms, and in May 2008 a reported 35.13 therms. In addition, says Ishimoto, four family members could now take showers in succession without running out of hot water. 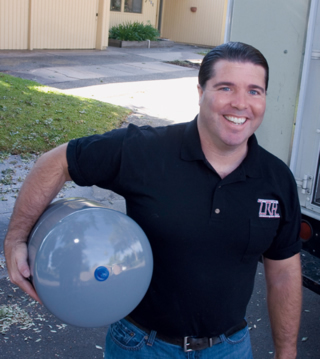 No matter what boiler model you choose, replacements usually take a day to install if you have an adequate storage tank, and two days if you need a new storage tank or you're replacing your boiler with a combo model. Sometimes new venting is necessary. The boiler installation project requires a single permit from the local building department. “Most contractors will get a permit for you, and the cost is different from town to town,” Eastman says. Before buying a new boiler, first make every effort to improve the energy efficiency of your home, and then have a heating contractor configure what unit size and model type is the best complement. Energy-efficiency improvements could point to a smaller boiler and a lower price point. A properly sized boiler will also operate more efficiently. 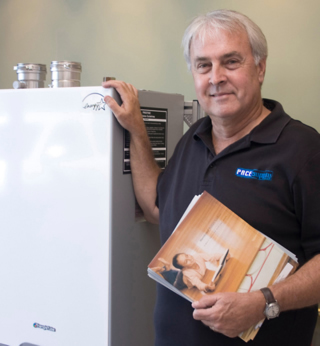 “We've seen some boilers that are too big for homes, and it defeats the purpose of purchasing a high-efficiency boiler,” Reid says.